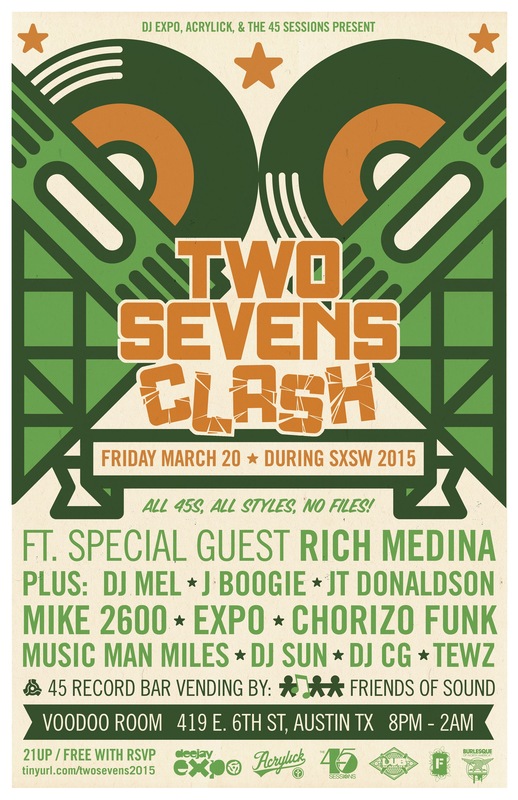 This year at SXSW a grip of homies will be slingin’ vinyl 45’s for another edition of Two Sevens Clash! I’m excited to take part in the festivities with an amazing line-up of DJ’s from across the country! This is the 5th year of Two Sevens Clash, and we’ve got an awesome lineup (peep flyer below), including Rich Medina as headliner! RSVP for free entry: here. FB link here. Texas born and raised, DJ Chorizo Funk, is one of the premiere sound selectors in the lone star state. His deep passion for music and technical skill behind the turntables guarantee a soulful experience for music lovers and dancers. He's able to seamlessly mix and connect the dots amongst a wide range of genres such as Afro-Latin, Afrobeat, Funk, Soul, Hip Hop, and more. New Merch: Chorizo Funk Spurs logo Tanks now avail! Chorizo Funk Spurs Tees now available!